Start from OneNote 2010, when you creating new notebooks, you can save notebooks to SkyDrive directly so they are available to you everywhere. On your PC, open OneNote 2010. Now notebooks will be automatically synced among different OneNote clients if they are online. System tray icon reappears every time OneNote is started, how to turn it off? Go to File, click options, and then click display tab, uncheck Place OneNote Icon in the Notification Area of the Taskbar. Note: Turn of OneNote icon in taskbar also turn off OneNote Snap Tool, if you wish to use Windows key + S to bring up OneNote Snap Tool to capture screenshot, you will need to have option Place OneNote Icon in the Notification Area of the Taskbar marked. Change Place OneNote Icon in the Notification Area of the Taskbar option back to marked will get OneNote System Tray Icon back. I previously used Alt+PrintScreen key for screenshots and then pasted into MSPaint and then edited the picture, and then capture just part of a screenshot. Now a better way is install Microsoft OneNote and take screenshot via the WinKey + S and then select the portion of the screenshot you want and paste anywhere. And yes, it’s better than Vista/Win7’s snipping tool in my option. 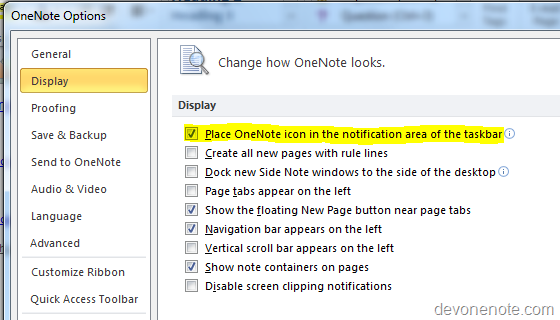 OneNote 2010 has a new feature, it remembers notes you’ve read and highlights new changes since you last read. All new unread content on pages will be highlighted with green highlight. This is very helpful for people who use OneNote for team collaboration. Everyone can easily see what exactly others has added and/or contributed. The pages contain unread content will have bold text in tab and all unread content will be highlighted in green. New content with green highlight. 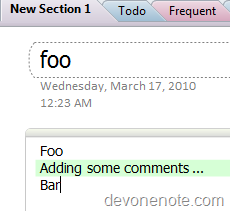 I recently upgraded to Office 2010 BETA and I notice an annoy bug in OneNote 2010. 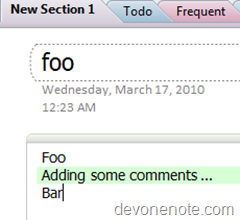 There is a feature in OneNote 2010 which will highlight unread content after notes are synced between two PCs. However, it can’t detect whether those content is read or not so the green highlighting will stay there forever. The workaround is right-clicking on the notebook and choosing to Mark as Read. By doing this you tell OneNote I read it and please remove the green highlighting. This also makes unread bolding go away.